Heating or Cooling Operation—Therminol 59 has surprisingly low viscosity for a high-temperature heat transfer fluid. It is ideally suited for combination heating and cooling applications, delivering excellent heat transfer rates even at 20°C (70°F). 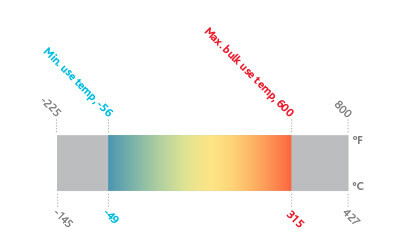 Batch processes will benefit from the excellent cooling performance Therminol 59 delivers. Superb Low Temperature Pumpability—Low viscosity at exceptionally cold temperatures makes this an ideal fluid for northern climates. In fact, Therminol 59 was originally developed for use on the North Slope in Alaska, a supreme test of low temperature pumpability. Long Life Means Low Cost—Users can expect many years of reliable, trouble-free operation even when operating continuously at the recommended upper temperature limit of 315°C (600°F ). Long life means fewer fluid change-outs and that means low operating costs, which are critical in today’s highly competitive business environment.